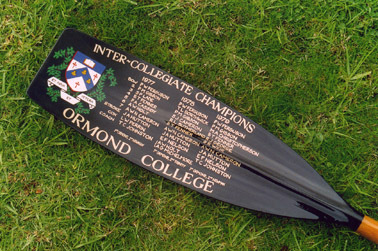 Whether on display at rowing clubs, adorning the walls of old college dining halls or above the bar at dark student filled pubs, the trophy oar is one of the most revered and eagerly sought after sporting awards. 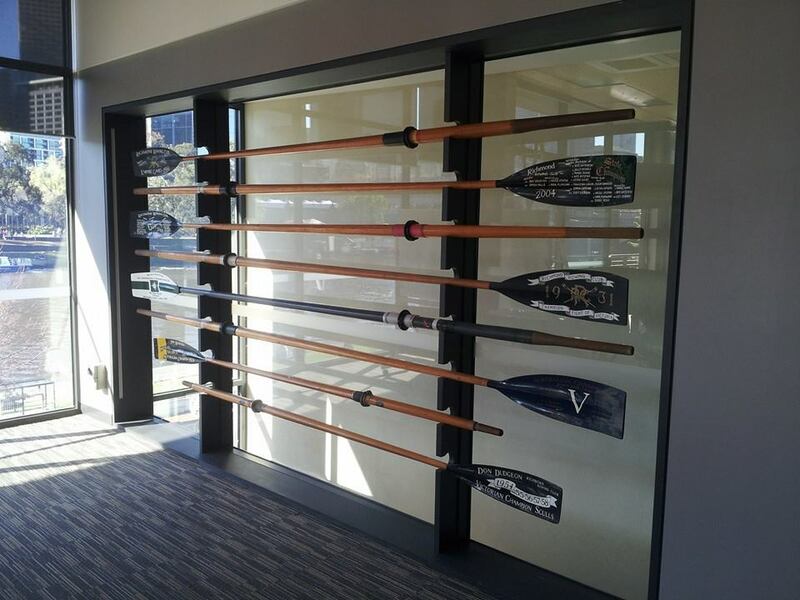 The grand sporting history of a club or college can be displayed through the years by the number of oars collecting dust on the walls of what now seems hallowed ground. 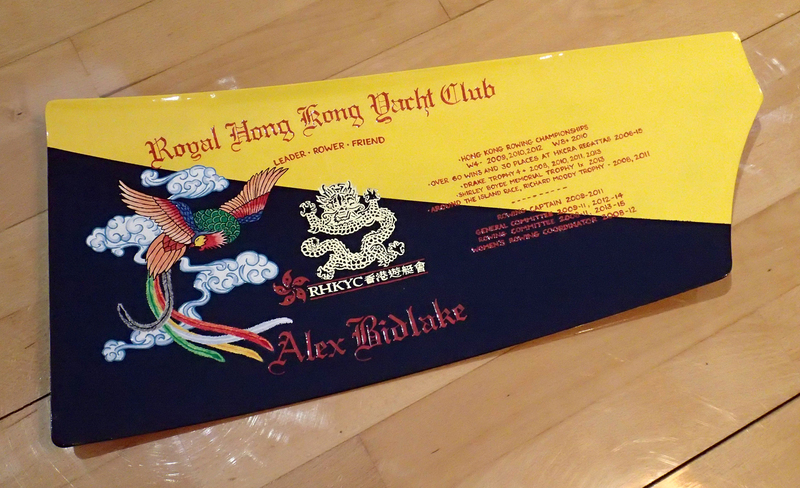 How strange these things appear. 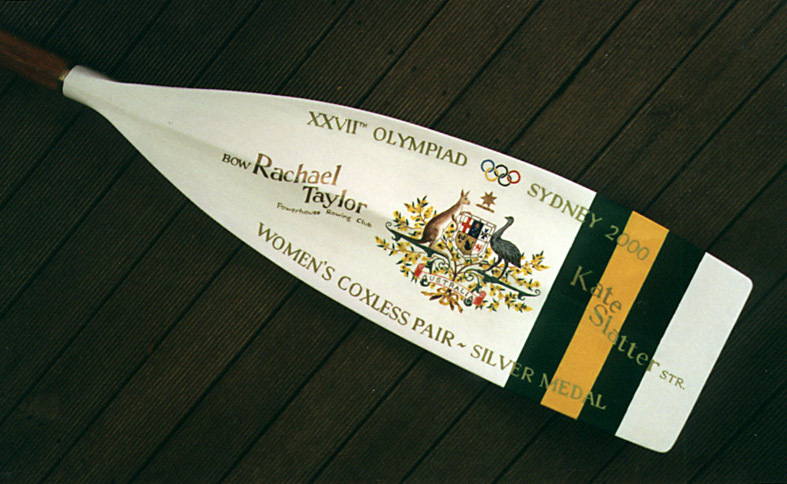 In the sporting world where medals and large silver mugs dominate how do we find ourselves with these odd 12 foot 6 inch timber keepsakes? 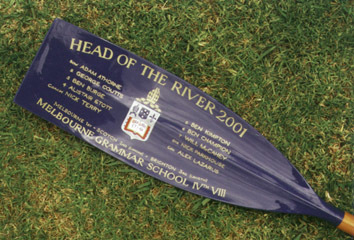 The origins of the trophy oar are somewhat of a mystery. 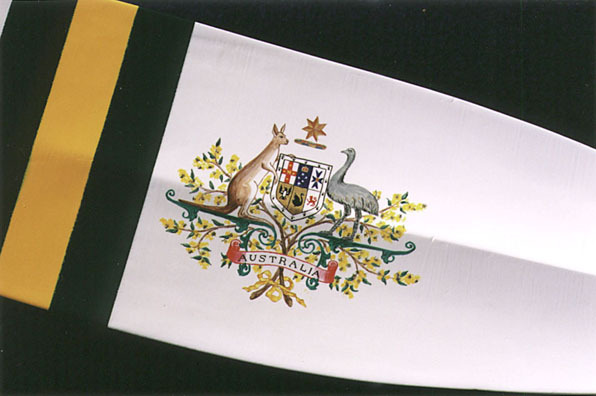 When I began looking into the topic I could find little academic reference. 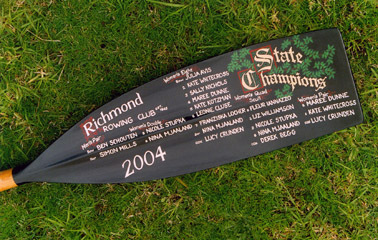 The earliest oars that you might see on display in my homeland Australia would be easily pre-dated by those from Europe, the United Kingdom and North America. 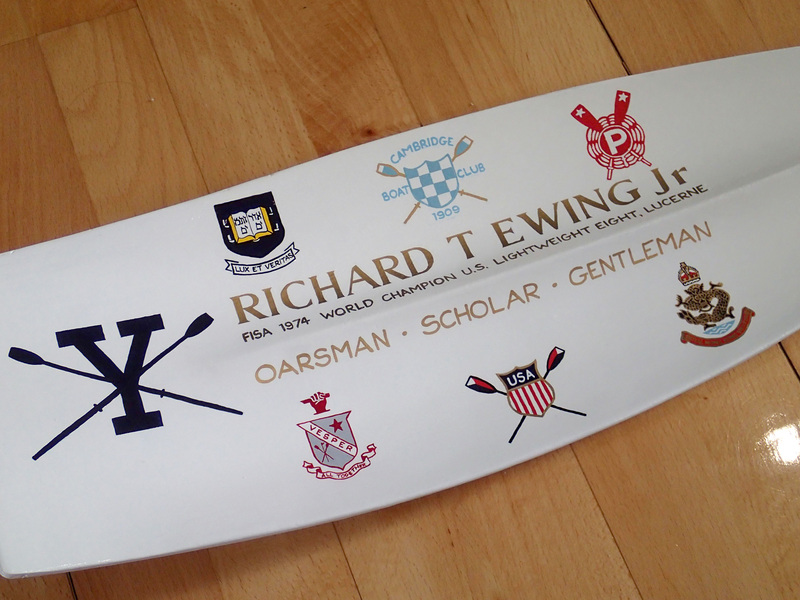 Rowing historians in England and the USA were stumped when I posed the question on the origins of the tradition. 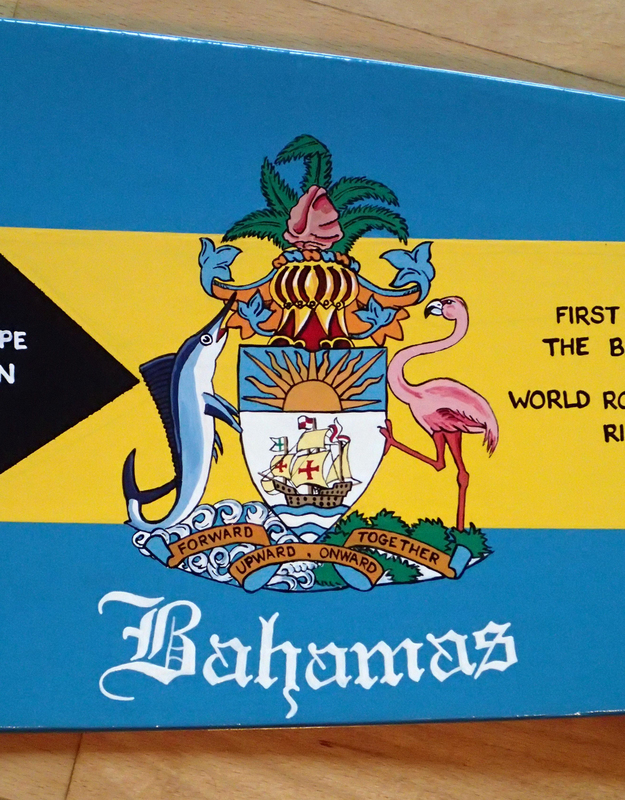 However, even without any direct evidence, we can discuss some possible explanations for the tradition and gain some insight as to when it all began. 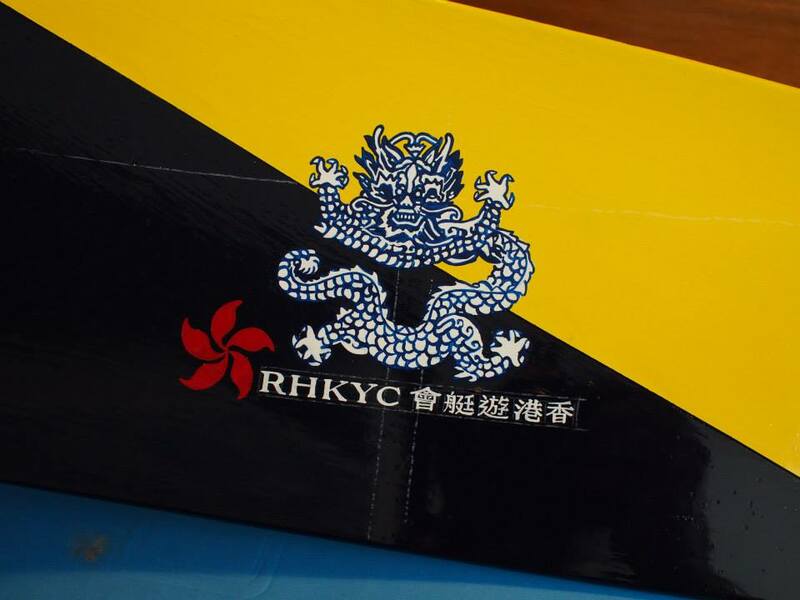 Racing in rowing boats has no doubt occurred since ancient times on rivers like the Nile, the Euyphrates and possibly even the Yangtze. 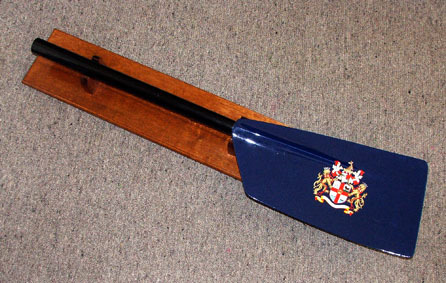 In modern times the ‘Coat and Badge’ race on the Thames in London is seen as the beginning of rowing competition. 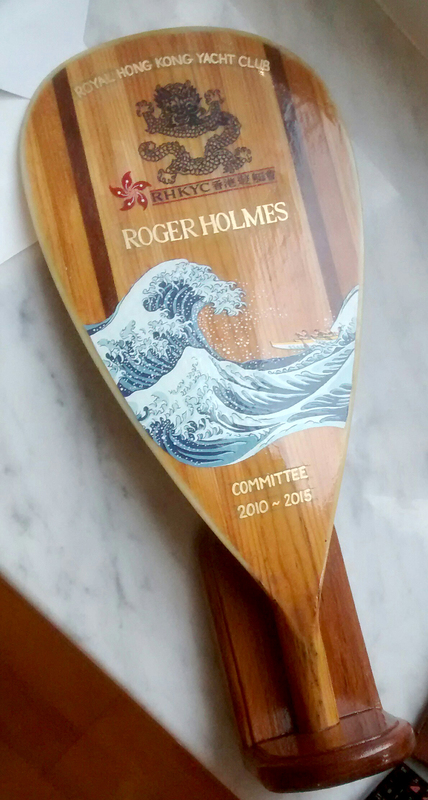 In 1715, Mr Thomas Doggett established a prize for watermen in their first year of apprenticeship, to be raced for on the Tideway in London (August 1), that is now one of the oldest, continually running athletic contests in the world. 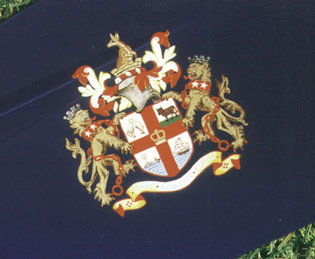 Dogget’s Coat and Badge Race became a symbol of prestige for the professional boatmen and the splendid scarlet jackets with badge certainly do look the part. 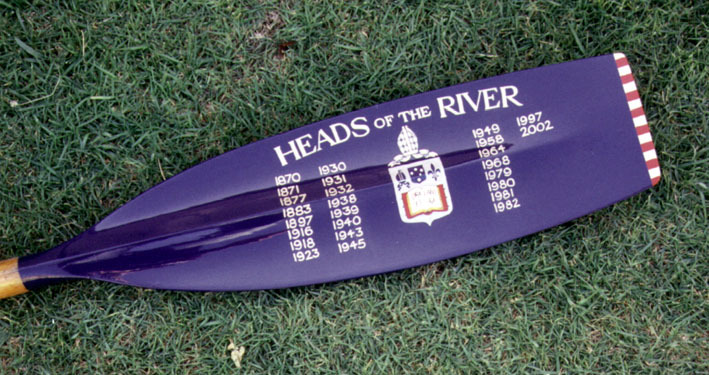 The gentlemen of England soon too were competing with rowing becoming a feature at schools like Eton with river ‘processions’ as early as 1783 and then later with racing at the universities of Oxford and Cambridge. 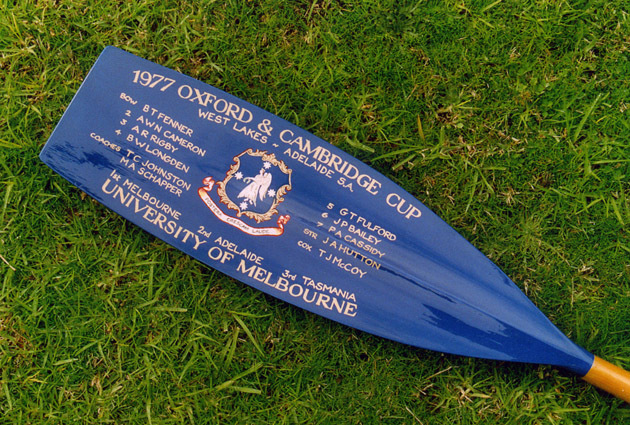 The famous race between the two rival universities, simply called ‘The Boat Race’, was first held in 1829 and continues to this day. 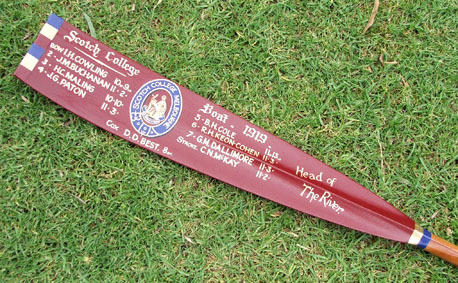 The oldest trophy oars that are on record date back to the early Oxford and Cambridge ‘Boat Races’ and seem to have been rather simple affairs. 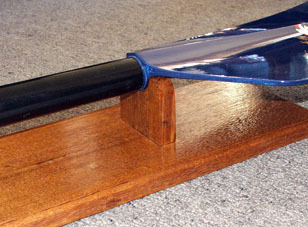 By the middle of that century, the 1850’s, a few blades survive that contain a few lines of text on an otherwise unadorned blade. 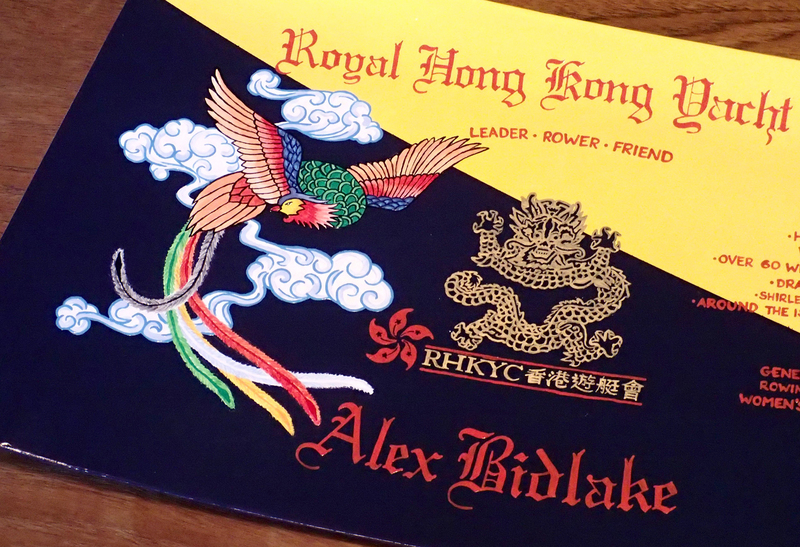 By 1870 the blades contain details such as the race results, names of the crew and colourfully rendered college arms. 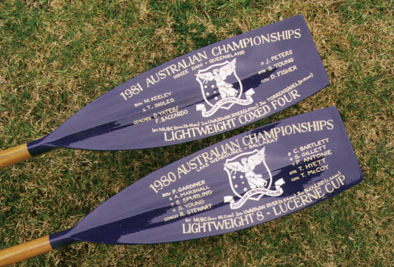 Many thousands of these blades must have been made to celebrate the wins at the college competitions, regattas and ‘bumps’ races held at the two universities over the last 150 years. 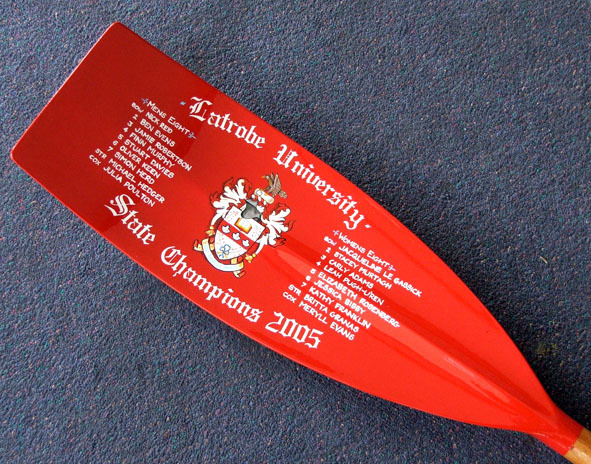 These later blades are perhaps most familiar to us as they are the traditional model for many of the 20th century trophy oars that grace the establishment public schools, old rowing clubs and indeed even residential colleges at our universities. 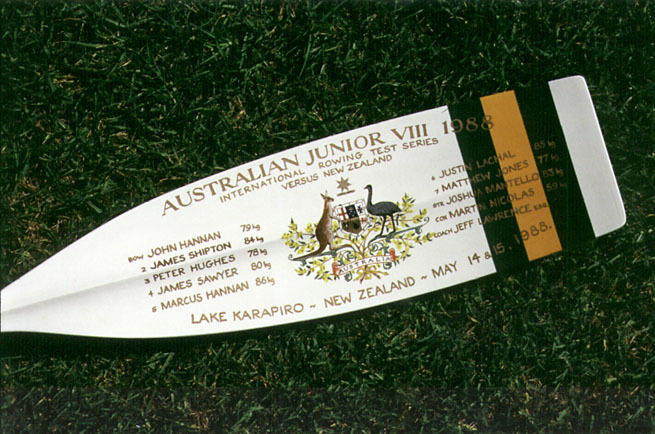 Although the oldest race on record in Australia is 1805, many of the earliest blades in Australia date to the ‘Inter-colonial’ races of the late 1850s and to the first public schoolboy races in the 1860s. An old news magazine woodcut (c.1887?) 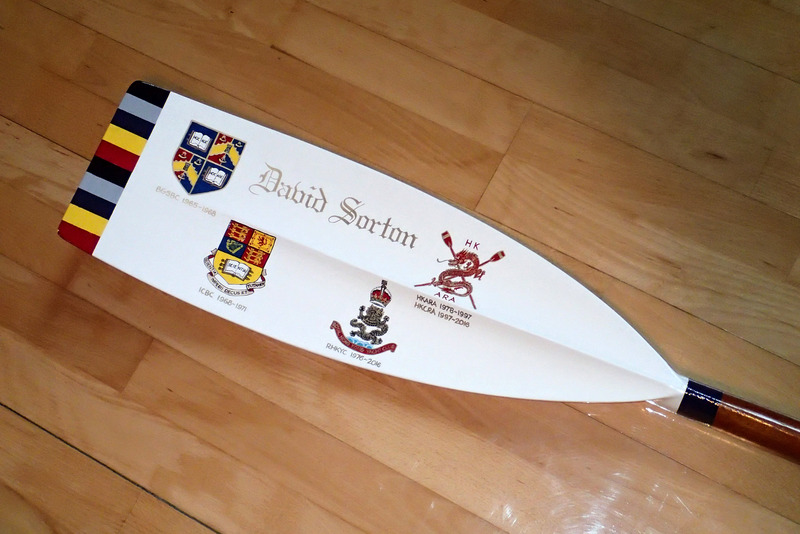 showing the “typical university student” which clearly shows an illuminated blade on his study wall. 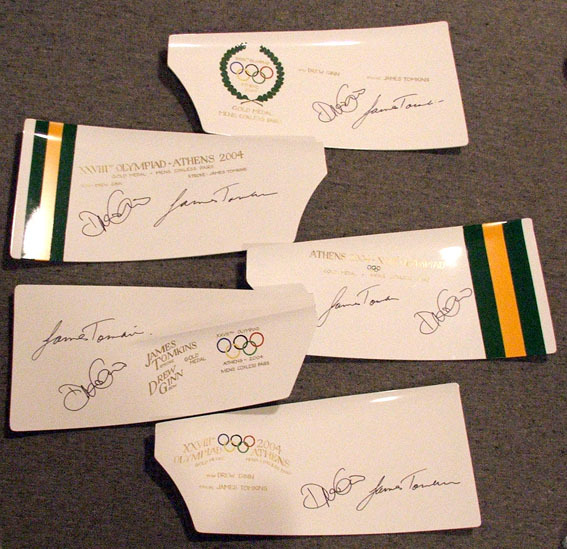 Thanks to the Tom Weil Collection. 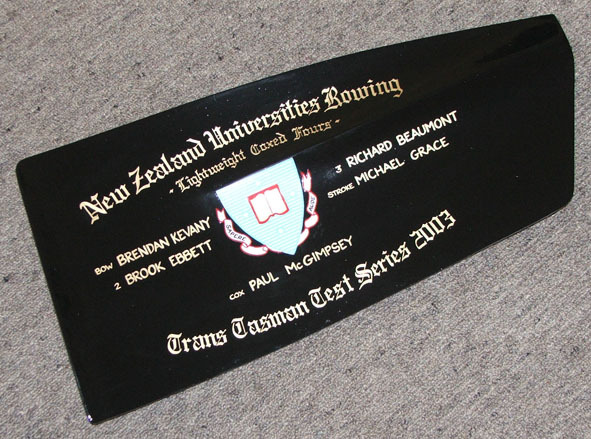 Although we can trace what seems to be an evolution in the style of the trophy oar we are no clearer on the origins. 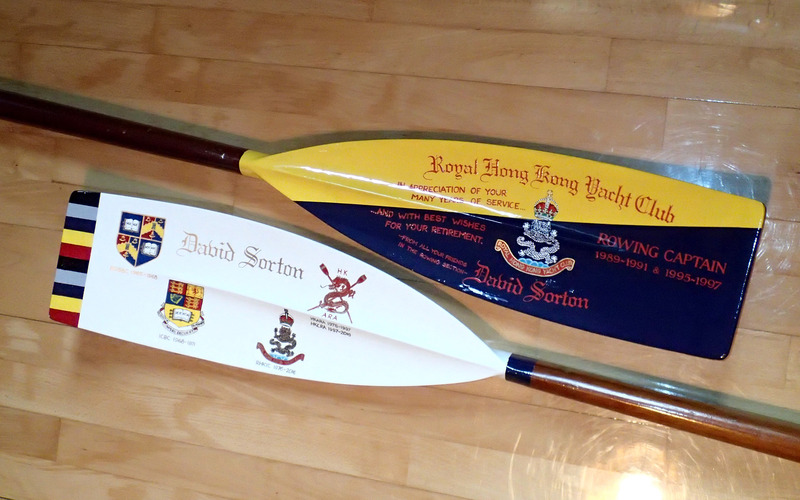 Why all these oars from schools and universities? 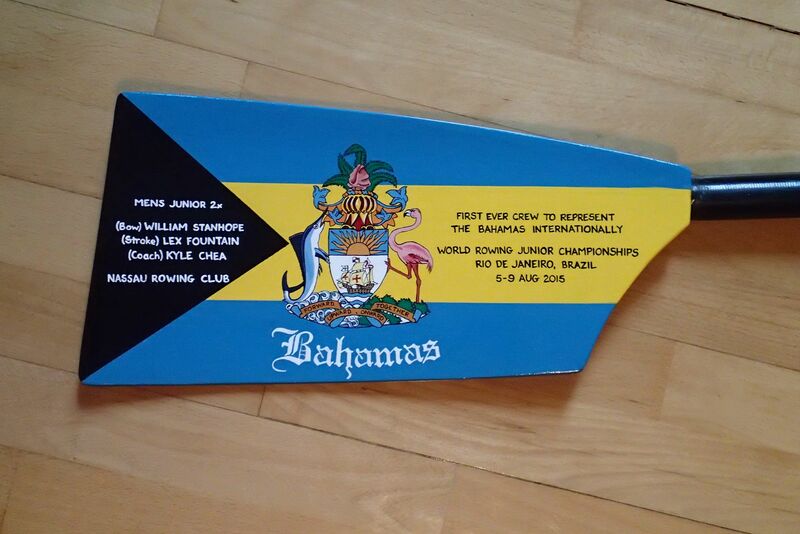 Why an oar in place of a prize or medal? 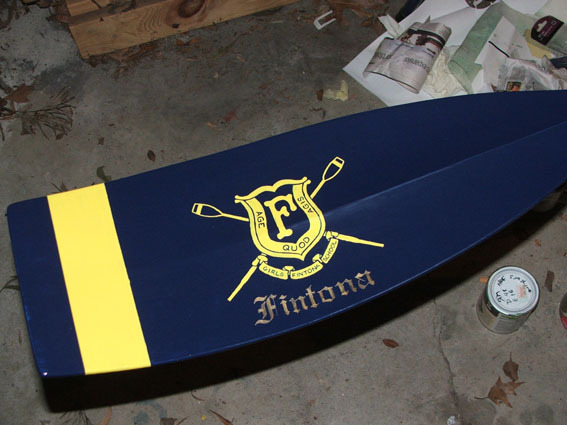 Perhaps the answer lies in the amateur status that rowing now enjoys. 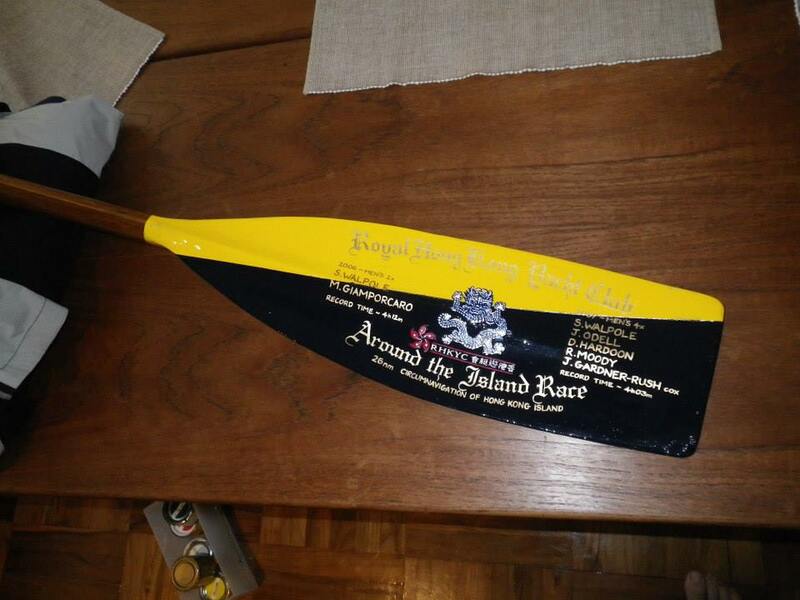 The ‘Coat and Badge’ race was for professional men, men whose trade it was to row the Thames. 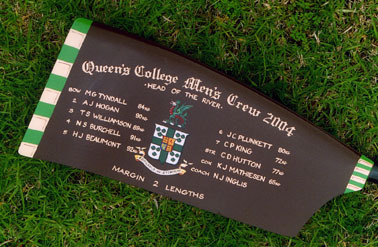 Racing and gambling are always found together and rowing is no exception. 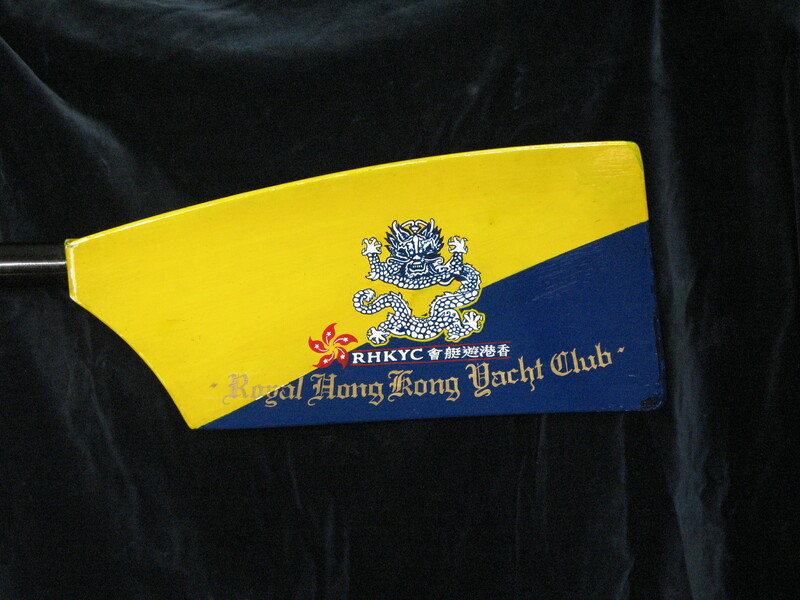 Many famous scullers from around the world competed in races for large purses. 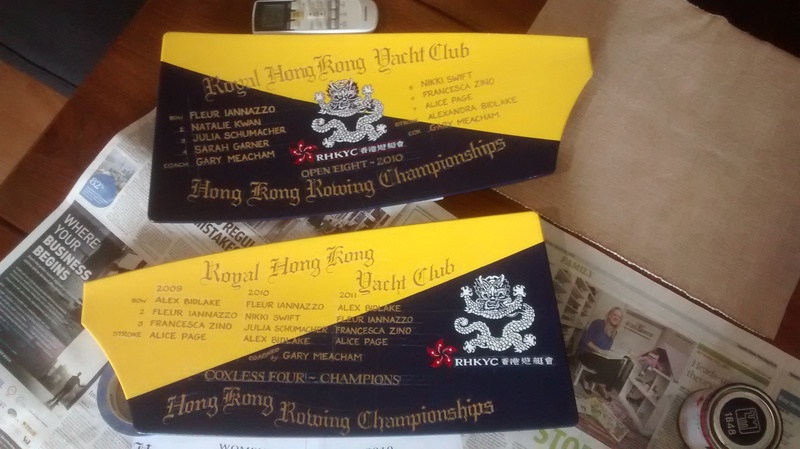 Many a fortune was bet and lost on the result of such contests. 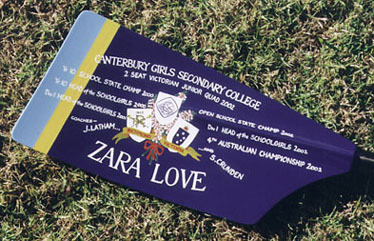 Champions from Australia, New Zealand, Canada, the US and Great Britain travelled great distances to compete. 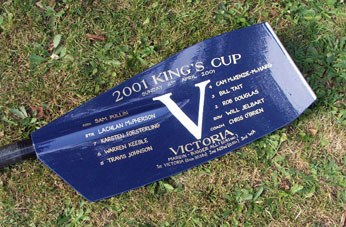 The film ‘The boy in blue’, starring Nicholas Cage, is based on the story of the Canadian Ned Hanlan, a champion professional. 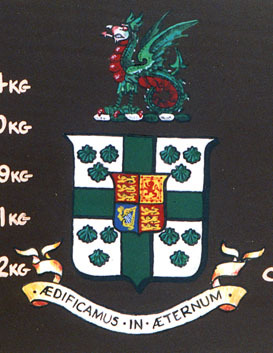 As with other sports, in particular Rugby, there was a dispute between the professional and the amateur. 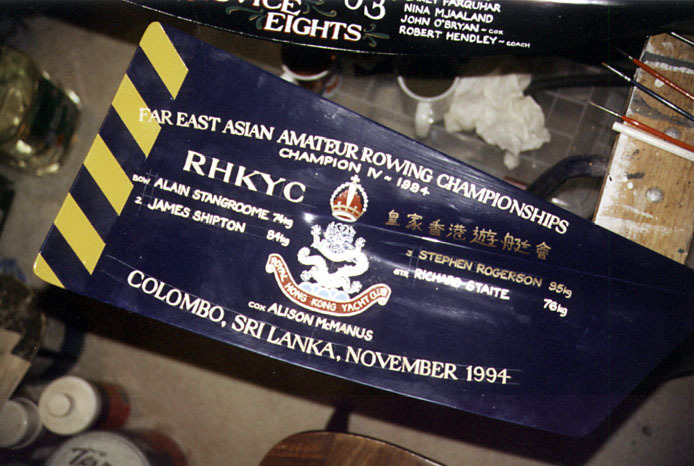 Where the sport of Rugby was split into the amateur ‘Union’ and the professional ‘League’, the betting in professional rowing led to race fixing, corruption and even sabotage. 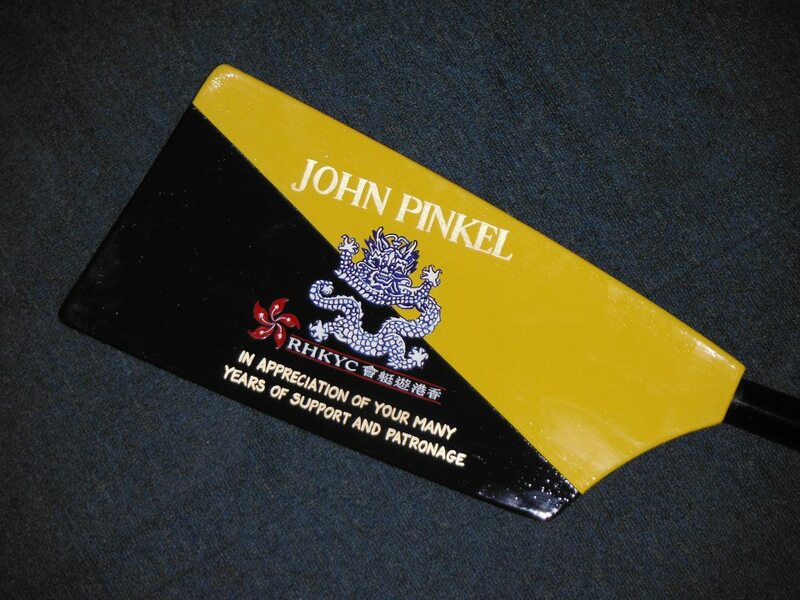 The ‘gentlemen’ regarded the amateur as more dignified. 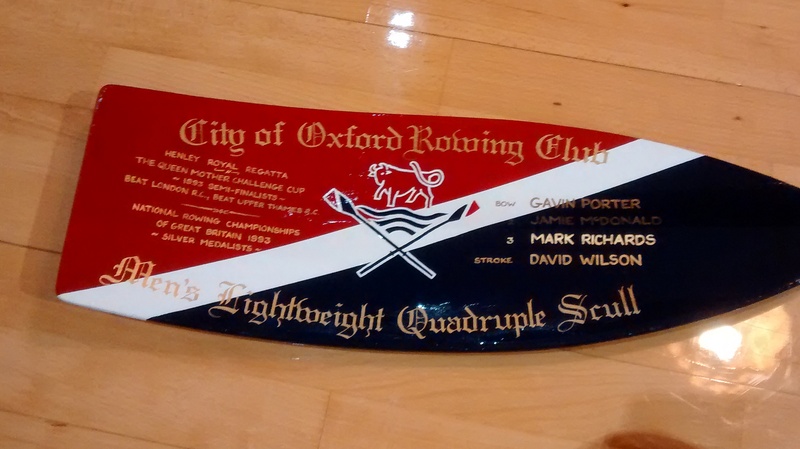 However, if a rower won his race at the gentlemanly environs of Cambridge and Oxford, or even Harvard or Yale, there was certainly no purse to collect and no individual prize to take home. 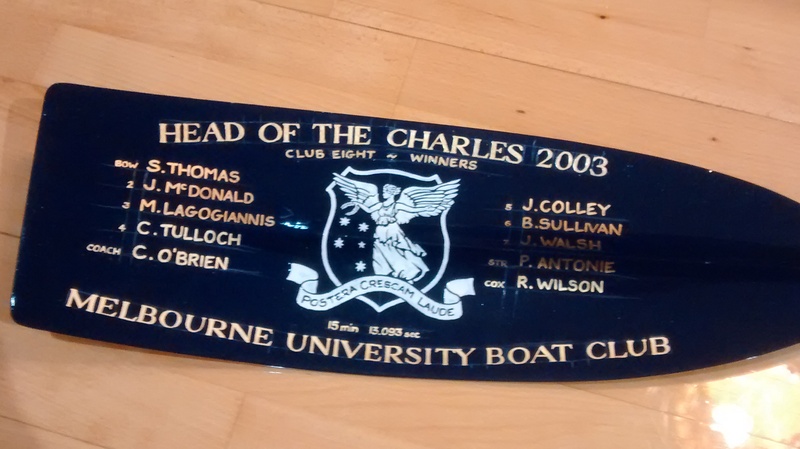 In seeking a memento of this event did this gentleman retain his winning oar? 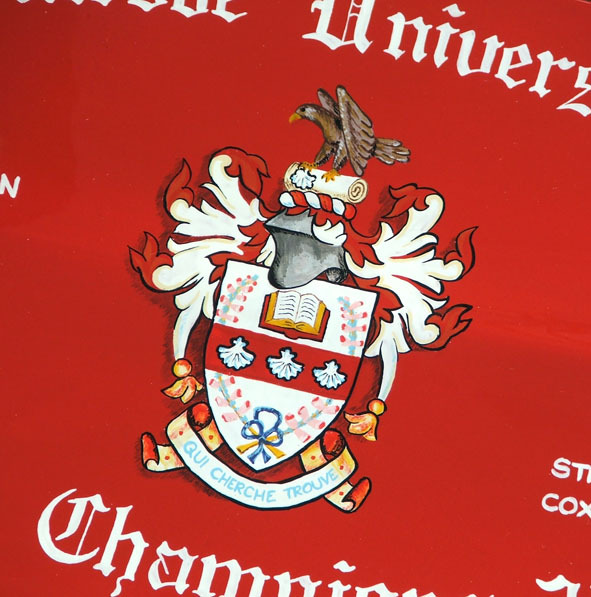 Perhaps his university or college presented it as a token of esteem? 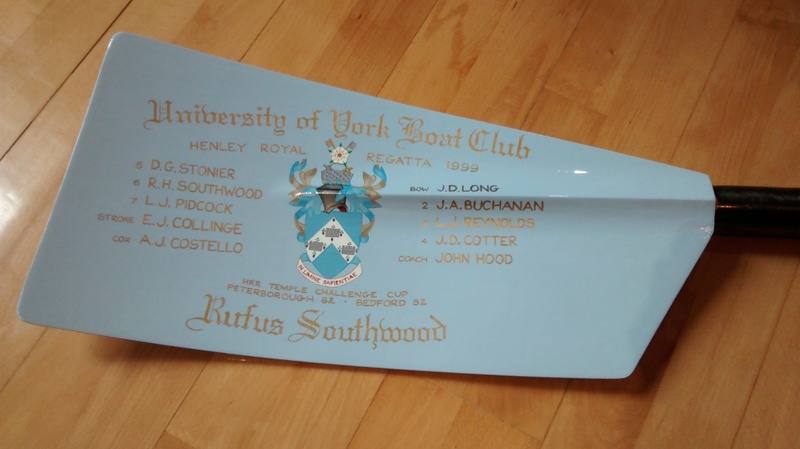 This may go far to explaining why so many surviving oars are from amateur races at universities and colleges while the exploits of the professional rowers are now merely tales from an age past, never committed to timber with paint. 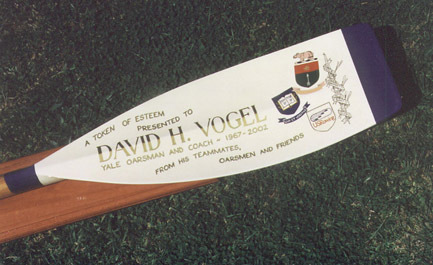 The tradition of the trophy oar still lives on. 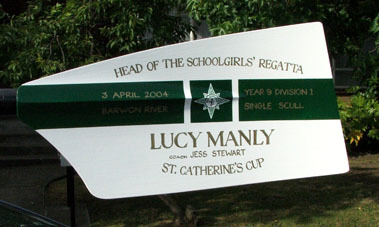 There are many oars created each year to celebrate the major public school races and even some of the club events. 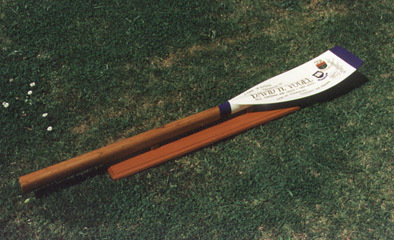 The results of major international events such as the Olympic Games and the World Championships are also often preserved on the medium of an oar. 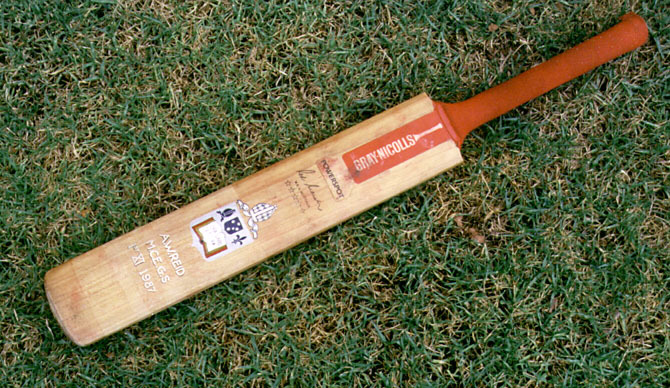 It is certainly not without it’s expense. 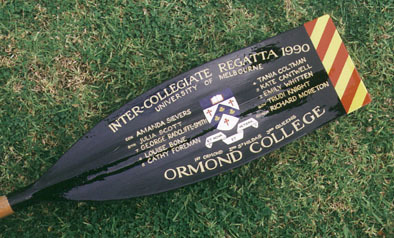 A new oar made from carbon fibre costs about $500 and it is only the wealthy club that could afford to part with eight of them for a major victory. 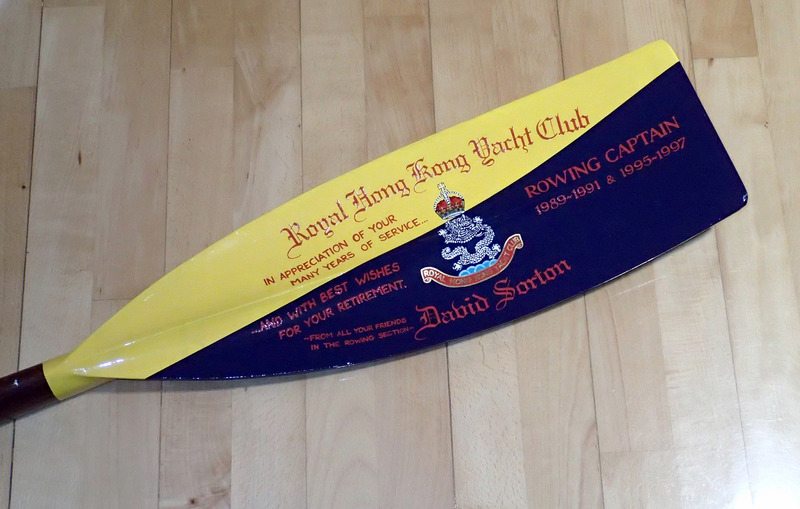 Older style ‘macon’ timber oars from 1960 onwards are becoming less easy to find at a price, and the even older ‘pencil’ shape oars from the early part of last century are incredibly rare and priced accordingly. 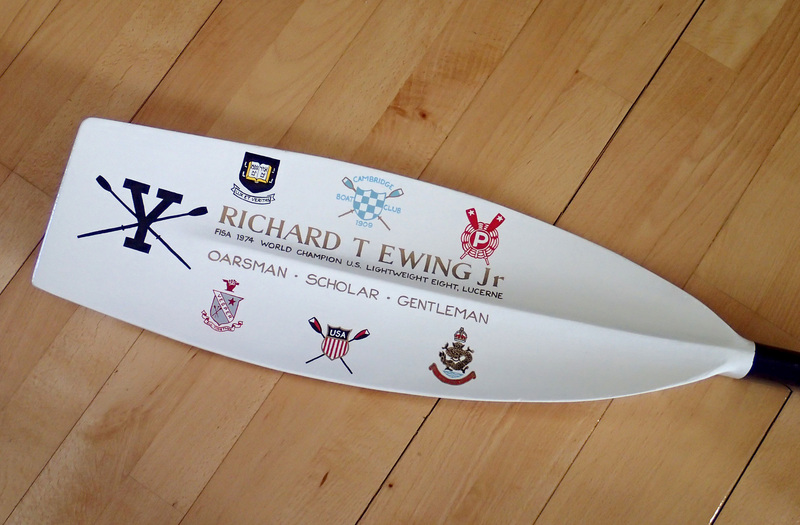 Only the few oarsmen and women, those who have looked up at the sacred walls adorned with oars past, will make the commitment to preserve their achievements in a lasting way. 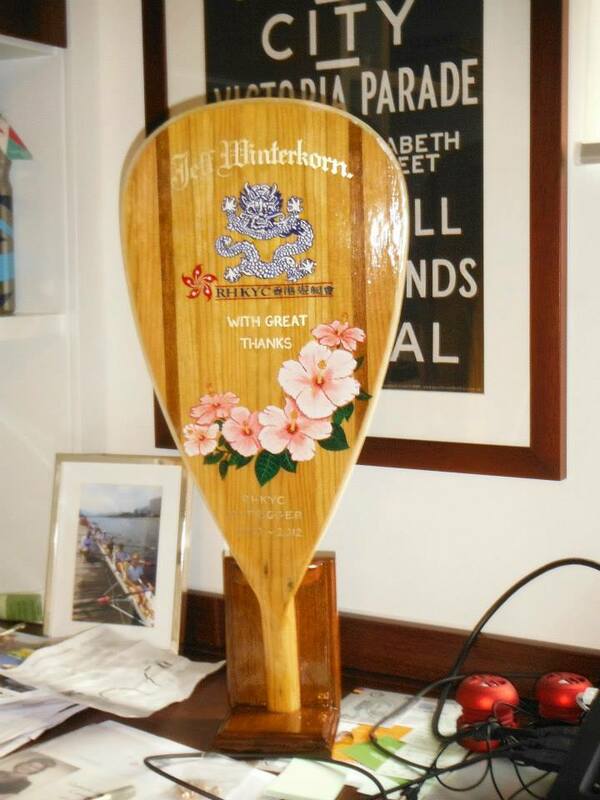 The illuminated trophy oar will continue to be that most aspired to reward. 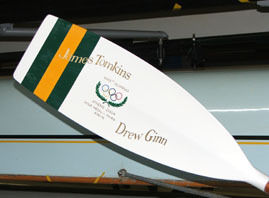 For the curious, try www.rowinghistory.net or the River and Rowing Museum for more history of the sport of rowing.